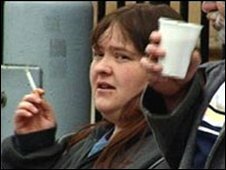 A woman from Renfrewshire who starved her dog to death has been banned from keeping animals for life and ordered to carry out 240 hours community service. 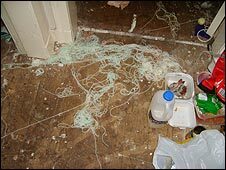 Paisley Sheriff Court had previously heard how Andrea Smiley, 28, deprived her Alsatian, Snowy, of food and water at her home in the town last year. Sheriff George Kavanagh told Smiley her actions were "callous". The Scottish SPCA described the case as one of the most distressing it had ever had to deal with. Sheriff Kavanagh said the dog had relied on Smiley for "its care and wellbeing" but instead she had imprisoned it in what amounted to a dungeon where it suffered "a lingering and painful death". "Your actions were callous. I have no doubt that you were capable of understanding that there existed a number of excellent agencies who care for or re-home animals," he said. "You neither contacted them, nor anyone else. This stomach-churning case is made all the more distressing by the apparent lack of remorse you have shown for your actions. "Other animals have to be protected from the fate of Snowy, your dog, so I have no hesitation in imposing the following disqualification. "You are banned from life from owning or keeping an animal, dealing in any animals, transporting any animals, working with or using animals and providing any service relating to animals." Sheriff Kavanagh said Smiley risked a jail term if she breached the community service or any part of the ban. Before sentence was passed, Smiley's defence agent John Gardner made a plea for mitigation. He said two psychiatric reports had been submitted showing that his client was emotionally unstable and experiencing bouts of depression which led her to self-harm. He also said she was living in fear after being threatened following publicity from earlier hearings. Under the Animal Health and Welfare (Scotland) Act 2006, Scottish Courts can impose a prison sentence of up to one year; a fine of up to £20,000 and a life ban on keeping animals.